I thought we'd take a closer look at the Smithfield Street Bridge before we continue up the Monongahela River. In this photo we can see that the lower, tension member is actually a suspended cable. As the top (arch) member is flattened and stretched by the deck load, it is restrained by the bottom (suspended) member, which puts the arch in compression and the cable in tension. There are three lenticular truss members per span, probably with the upstream member added when the bridge was widened. The three trusses are restrained transversely by cross members at the top of the arch. The lenticular truss is an effective structural shape; skinny at the ends and thick in the middle, but the long flexible members must allow a lot of deflection whenever a big truck drives over the bridge. 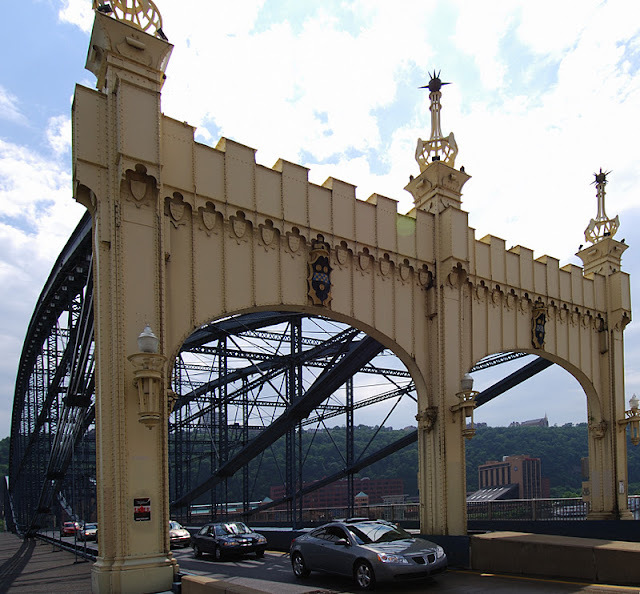 Pittsburgh's Bridges: Smithfield Street Bridge (2) by Mark Yashinsky is licensed under a Creative Commons Attribution-NonCommercial-ShareAlike 3.0 United States License.